Stephen Hawking once wrote a paper where the title of the first slide (I write from doubtless imperfect memory) was something like “On the Breakdown of Physics in the Region of Space-Time Singularities.” The title of the second was “On the Breakdown of Physicists in the Region of Space-Time Singularities.” Ethan Zuckerman has a smart post which suggests that the real Twitter in Iran story is about the physicists rather than the physics. The interesting social phenomenon is not the use of Twitter by Iranian dissidents, but the media’s collective convergence on framing the story of what is happening in Iran around Twitter. One of the reasons MSM outlets are so focused on social media is that they’re not able to deploy reporters to cover these protests. In some cases, the majority of reporting from the ground is coming from social media. It’s worth asking what the biases might be in amplifying those social media reports. Ahmedinejad’s supporters tend to be poorer, more rural, less educated and more likely to speak Farsi than Mousavi’s supporters – a picture of the protests via social media runs the danger of overstating Mousavi support or minimizing Ahmedinejad support. I’ve written at some length about homophily, the tendency of birds of a feather to flock together. Turns out that reporters flock, too. It’s somewhat amazing to me the extent to which reporters from really good newspapers are all asking the same questions. I’m glad that people are taking a close look at the phenomenon of social media in the Iranian protests – it’s an important, fascinating and worthwhile topic. But there’s a lot of topics out there, and I wonder whether we benefit from a thousand well-researched stories on this phenomenon rather than a hundred, and nine hundred other stories. Ethan’s own research is on global attention profiles – the differences in the relative amounts of attention that news sources pay to different parts of the world. This is a nice demonstration of how this may work in practice. Ethan also links to an overview of the debate by Gaurav Mishna which suggests that there are less than 10,000 Twitter users in Iran, and that only around 100 of them seem to be active (Mishna provides no source for the second figure – I presume that it is taken from his own research). Even if there turn out to be more Twitter users in Iran than Mishna’s figures indicate, I strongly suspect that his underlying claim is correct, and that Twitter has played little, and perhaps no role in actually organizing protests. 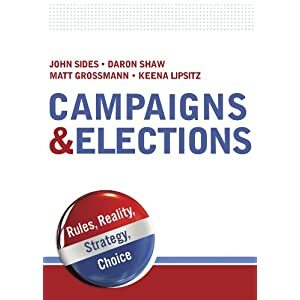 This comports with any experience I’ve had working in campaigns in the US for the last 5 years. The internet isn’t really that effective in getting people to do things any more than talking to your neighbor over a fence.